Stepping Stones is proud to continue our partnership with CFL Pizza, LLC and host a spring fundraising campaign to benefit our programs. Since 2016, the Pizza Hut franchise has raised more than $40,000 for Stepping Stones. Their staff have also completed several volunteer projects at our four program locations and welcomed participants of Adult Day Services on private tours of their restaurants. On April 3, a Greater Cincinnati Pizza Hut fundraising campaign will kick off with thirty-two stores raising support for Stepping Stones. The ten-week campaign will continue through June 17 and invites customers to add donations to support our programming directly onto their bill. At Stepping Stones, it is our mission to build pathways to independence for people with disabilities. 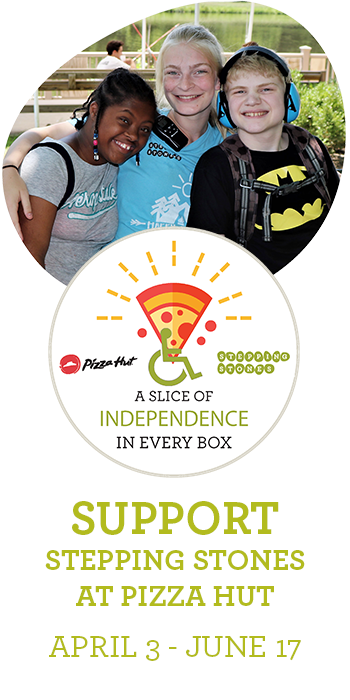 We are thankful and proud to once again partner with the Pizza Hut family to deliver a slice of independence in every box. Planning a pizza party for your friends, family coworkers or teammates? Choose Pizza Hut and support the campaign by making a donation to Stepping Stones. Their staff will be able to add a $1, $3, $5 or $10 donation to support our programs directly onto your bill. Note, unfortunately there is no option to make a gift to Stepping Stones via online orders. To participate in the campaign, please phone or visit your nearest Pizza Hut from the list below. Every $10 donation to Stepping Stones will receive a FREE order of Pizza Hut’s famous breadsticks. Below is a complete list of the thirty-two stores participating in the Greater Cincinnati Pizza Hut fundraiser for Stepping Stones – including locations in Northern Kentucky and Indiana. Call or visit your nearest store to order delicious pizza and make a gift to support our programs! Interested in more information on Stepping Stones’ partnership with Pizza Hut? Click here to view a photo gallery from last year’s events.